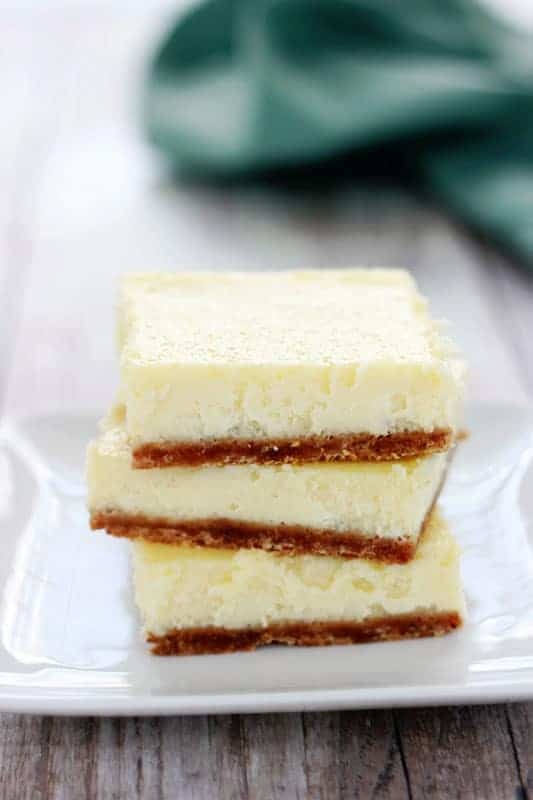 Easy Cheesecake Bars. This no-fail cheesecake bar recipe is the perfect alternative to the classic dessert! In just 45 minutes you have perfect bars ready to serve! The truth is I have made this recipe time and time again. I have got a blueberry, strawberry, and salted caramel version on the site already, and it always seems to be my go-to whenever I need a quick dessert. I love classic cheesecake but it can be fickle and time consuming. These bars are basically no-fail. Everything starts with the crust. I use graham crackers with just a touch of cinnamon for a little twist. Press it into your pan and top with creamy filling. After that you just bake and chill. These beauties cut and come out of the pan perfectly and are always a hit for parties or dinners. Quick confession, sometimes when it is late at night, and one or two of these are still in the fridge, I indulge in a blueberry version. Put one tablespoon of frozen blueberries in a bowl, sprinkle with just a touch of sugar, and heat until warmed. Using the back of a spoon press on the berries to release some juice and pour over the top of one bar. It’s blueberry cheesecake bliss. Like this recipe? 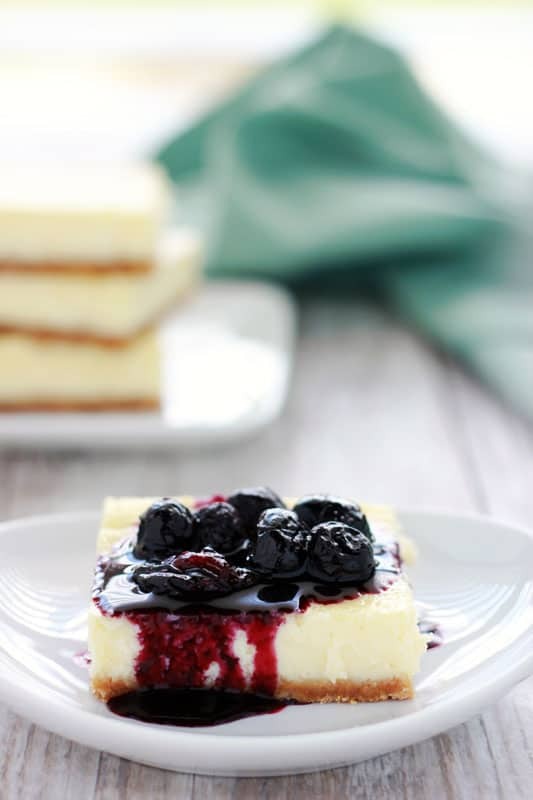 You will love my Cheesecake Recipe, Salted Caramel Cheesecake Bars, and Blueberry Cheesecake Bars! Preheat your oven to 375 degrees. Mist a 9×9 square pan non-stick spray. Set aside. 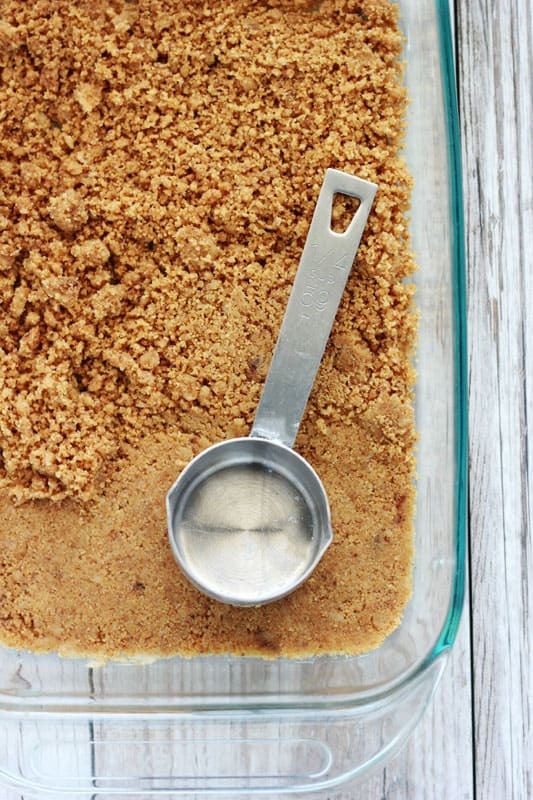 Stir the butter, graham crackers, flour, and 2 tablespoons of sugar together with a fork. Press into the bottom of you prepared pan. Bake for 8 minutes or until light brown. Bake 30 minutes or until the center looks like it has set. Cool until room temperature and refrigerate for at least 2 hours if not overnight. These look delicious but I’d like to clarify the amount of cream cheese used. Is it 1 and 1/2 packages (8 oz each) cream cheese? Thank you and I’ll be making these soon! Correct. So one full 8oz package and 1/2 of a second 8oz package. looks like a 9 by 13 pan? not a square one? also how many servings? You’re right. I actually doubled the recipe for these photos to serve at a birthday party and they were made in a 9×13. However, I normally use a square pan and get 10 rectangular bars or 20 square. Is the baking time the same if you double it for a 9×13? I’d start at the time listed above and watch to see if additional time should be added. I normally cut 9 pieces but you could get away with cutting them smaller. Thank you, Tina! These are soooooo good and a perfect base for whatever topping you decide to use! 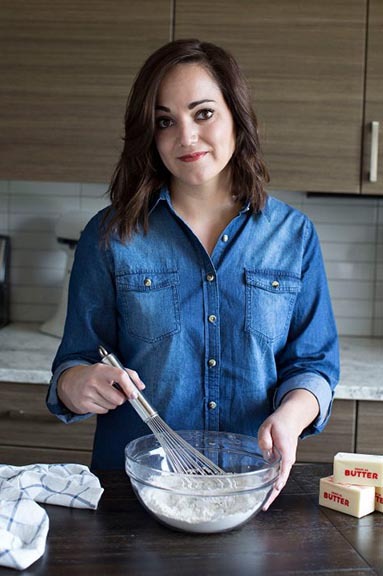 I’m making the 9×13….is bake time the same? Thanks!!! I have never attempted to freeze these bars but a quick google search suggests that cheesecake does in fact freeze well. These cheesecake bars turned out terrible! The batter was chunky, and very thin and frothy from all of the eggs. The top was too sticky and it didn’t come out of the pan when we took it out. The flavor was more like a custard than a cheesecake. Would not recommend making this recipe at all! I’m sorry you had a hard time with the recipe. I would be happy to walk you through the process to find out what went wrong. This is a tried and true family favorite that is a staple for family parties. I hate to think that someone was disappointed in the flavor. I think it would help if you clarified to cream the cream cheese and sugar together first. I am one who follows the recipe as it says. My first attempt I added the cream cheese, eggs, sugar, milk and vanilla together, however because there is so much liquid there wasn’t any way for the cream cheese to actually cream. I have my second attempt in the oven now, which I creamed the cream cheese and sugar fist then added liquids, hopefully this tastes more like cheesecake than creamy eggs 😟. Thanks for taking the time to provide feedback, Paige. I rewrote the recipe to include creaming the sugar and cream cheese together first. You have also inspired us to make it again tonight as a fun dessert. Thank you! 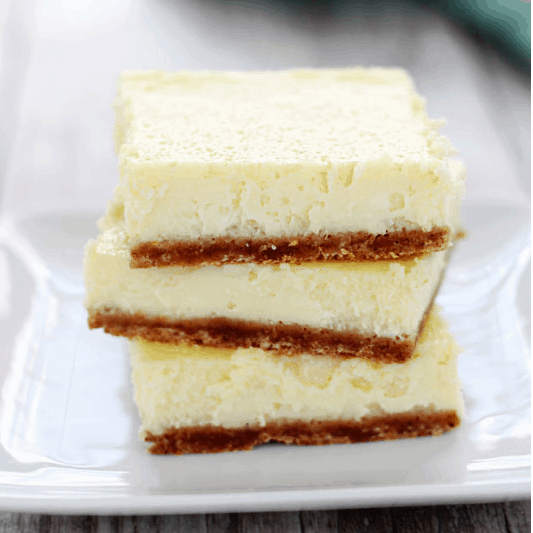 We really liked this for a base cheesecake bar! Creamy and super easy to make. I topped mine with blueberry pie filling. 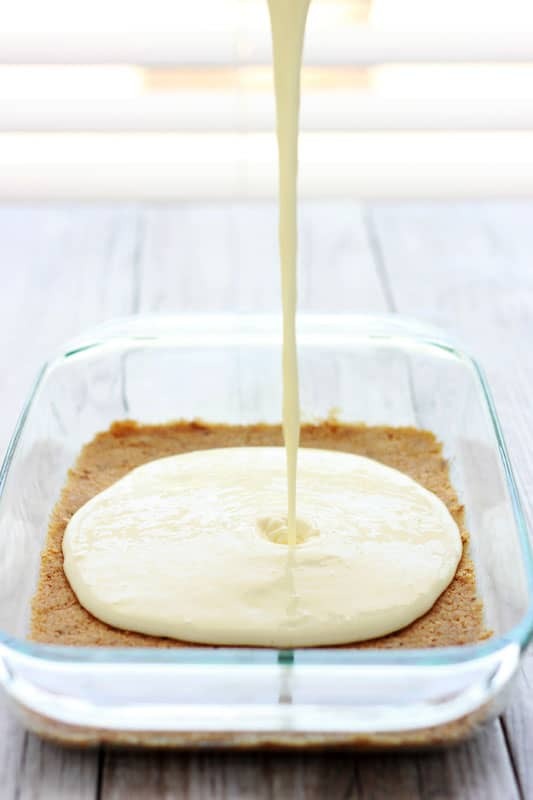 Much easier than my classic cheesecake recipe that I typically make.